Similarly like other SAP NetWever components (BW, PI, MDM) SAP Solution Manager (SMG) was re-versioned as well. This took place in May 2008 and SMG version changed its version from 4.0 to 7.0. By this it has same release number and it is aligned with SAP's decision to streamline its product offerings. So between versions 4.0 and 7.0 there is no change in its functionality, release schedule, installations, or other technical aspects of SAP Solution Manager. • Implementing and Upgrading SAP Solutions – central project administration, creation of Business Blueprints, Configurations, Group Rollouts, Templates, Roadmaps, system landscapes, documentation. • Solution Documentation – evaluation of business processes, support of custom developments and modifications. • System Administration – central system administration, landscape analyses, real-time system monitoring. • SAP Engagement and Service Delivery – Using of SAP Services as part of SAP Delivery, Issue management – Tracking problems. • Change Request Management and Change Management – support to change management processes. • Root Cause Analysis – Problem analysis and error-resolution. SMG has connection to BW as well. There is SMG related Business Content which enables to report SMG data in BW. See online documentation - BI Reporting in SOLMAN. There are DataSources called 0SM_SMG* under node 0SM_SMG_ROOT. Basically it serves for Business Process Monitoring reporting. Other connection of BW and SMG can be within transport request handling. In this case all BW transports can be managed from SMG. Are you interesting what’s a difference between SAP Process Integration (PI) and SAP Exchange Infrastructure (XI)? all integrated into one offering. Therefore sometimes it may happen that XI/PI is referred as PO - Process Orchestration. SAP NetWeaver Business Client - where to download it? I'd like to provide a download link where this software can be downloaded. -> Download -> Installations and Upgrades -> Installations and Upgrades - Entry by Application Group -> SAP Frontend Components -> NETWEAVER BUSINESS CLIENT -> Installation. Currently there is NWBC NW BUSINESS CLIENT version 3.0 available as of 22.06.2011. NWBC NW BUSINESS CLIENT 4.0 – download from here http://goo.gl/eGh5i or here. Please notice that links are being changed very often on SAP’s SMP. 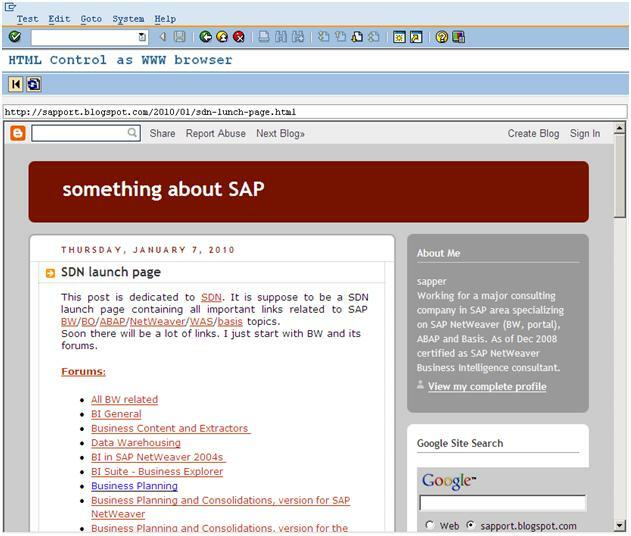 Therefore if you find broken link on this page go to service.sap.com/swdc and navigate to particular area. Also notice that you need to have valid SMP credentials in order to be able to download SAP’s software. · The Data Warehousing Workbench replaces the Administrator Workbench. · Functional enhancements have been made in the definition of InfoSets. · The transformation replaces the transfer and update rules. · New database functions support you in optimizing performance. · Functional changes have been made to the documents. · New authorization objects have been added. · Remodeling of InfoProviders supports you in information lifecycle management. · Repartitioning and reclustering support you in information lifecycle management. o There is a new object concept for the DataSource. o Options for direct access to data have been enhanced. o From BI, remote activation of DataSources is possible in SAP source systems. · The data transfer process distributes the data within BI. It replaces the InfoPackage for updating data from the PSA, and the Data Mart Interface for updating data from one InfoProvider to another. · Functional changes have been made to the Persistent Staging Area (PSA). · The InfoPackage is only used for loading into the PSA when the new concepts (transformation, DataSource, data transfer process) are used. · BI supports real-time data acquisition. · The process chains have been functionally enhanced. · BI provides functions for background management of BI processes. · BI provides functions for archiving request administration data. · Time-dependent hierarchies can be analyzed temporally in a query with a key date derivation type. · In addition to relational aggregates, the BI accelerator allows you to improve the performance of BI queries when reading data from an InfoCube. · Quantity conversion enables key figures with different units to be converted into a uniform unit of measure. · There is a new concept for analysis authorizations (previously: reporting authorizations). The Business Explorer provides a newly implemented version of the tools. There is also a new tool, the BEx Report Designer. Within enterprise reporting you can use this tool to create formatted reports that are optimized for presentation and printing. Business planning with SAP NetWeaver Business Intelligence provides a complete solution that is integrated into the BI system and can be used to create and use planning scenarios and other applications. This solution is called BI Integrated Planning. This planning tool uses the same data basis as BW-BPS and can run in parallel in a system. You use the TREX search engine to search for BI metadata in different modes: the simple search is a pure text search; the advanced search provides a function for searching by attribute and a function for searching according to specific restrictions, as well as a full-text search. On the Metadata Indexing tab page for the BI metadata search in the Administration functional area of the Data Warehousing Workbench, you can use Metadata Search/ Documents to check the required settings and to index metadata. · The open hub destination now has its own maintenance interface and can be connected to the data transfer process as an independent object. · A unified maintenance interface for DataSources makes it easier to create and change DataSources in BI. You can create and update DataSources for file source systems, UD Connect, DB Connect, and Web services here. You can display DataSources from SAP source systems and define various properties for the DataSources. Emulation supports the display of 3.x DataSources in DataSource maintenance and the use of the 3.x DataSource in a data flow with transformations. The migration of 3.x DataSources supports the conversion of old data flows to a data flow with transformation and data transfer processes. This allows you to use real-time data acquisition, for example. · The BI accelerator monitor is used for the technical administration and maintenance of the BI accelerator. It provides an overview of the current status of the BI accelerator. · When errors occur it can be useful to record system responses in the form of traces for the BI accelerator. SAP support has tools to evaluate these traces. · In the Translation functional area of the Data Warehousing Workbench, you can collect all the dependent objects for one or more metadata objects in the BI system and then translate their short and long texts. With the integration into the translation planner and the translation environment (transaction SE63), this procedure has changed. · A trace is a self-contained quantity of logged user actions. The trace tool environment (transaction RSTT) has special tools to record and play back traces (trace tool) as well as to process automatic regression tests (computer-aided test tool). The trace tool environment replaces the OLAP trace tool (transactions RSRTRACE and RSRCATTTRACE) and provides all of the functions necessary for a clearly enhanced application area. o +/- sign determination when you enter plan data has been improved. o BW-BPS uses the lock management concept of BI Integrated Planning. o Handling comparison columns in the planning layout: Reference data and plan data that is to be edited are handled separately so that reference data is not locked. · You can use the BW-BPS Status and Tracking System (STS) with BI Integrated Planning. This is useful if you are already using BW-BPS with the Status and Tracking System but want to use additional functions from BI Integrated Planning. · An example of how to integrate a BEx Web application has been added to the documentation on the Web Interface Builder in BW-BPS, along with information about the enhancement options provided by class CL_UPWB_BSP_APPL. o A newly implemented variable editor allows variables to be defined and edited. In addition, new functions are available such as replacing a variable with another variable or defining noncontextual variables. o Quantity conversion: In the properties of the selections and restricted key figures, you can set a target quantity for the structural component. o Publishing to the portal: You can publish queries directly to the Portal Content Directory (PCD) as iViews from the menu bar. o The parameters for the Chart Web item have been simplified. In the Chart Designer, you can assign values from the current color palette using direct input. The documentation has been extended to include the new Gantt diagram and MTA chart types. o In the Web Application Designer, a migration tool is available. 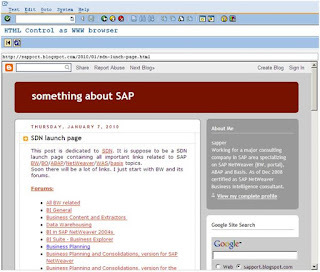 You use this to migrate Web templates from SAP BW 3.x format to SAP NetWeaver 7.0 format. o The Properties Pane Web item allows you to display and change the properties of a Web item. o Depending on the business case, you need to address some basic questions when creating Web applications. These questions allow you to use the BEx Web Application Designer and BEx Web Design API to design Web applications that match your requirements. In addition, examples are given of typical aspects of Web application design. o You can use the BEx Report Designer to easily and intuitively create reports that are optimized for presentations and printing. o The documentation has been extended to include the Information Consumer Pattern. · General Services in BEx - You can create print versions of BI applications. To do this, you first export the selected Web application or workbook to PDF format. You can then print the PDF version. A dialog is provided to support you in creating print versions. You use this dialog to specify the layout of the print version. · Information Broadcasting - The documentation has been extended and includes information about using text variables. o You can publish queries from the BEx Query Designer, Web applications from the BEx Web Application Designer, and reports from the BEx Report Designer as iViews to the Portal Content Directory (PCD). o BEx Web applications or queries can be displayed as iViews in various portals with the help of various concepts. · BEx Analyzer - In the BEx Analyzer, you can execute a report on the Web without starting the Web Application Designer. You can drill down and collapse the characteristics in a report by double-clicking them. You can change the position of a design item in a workbook using drag and drop. New authorization objects have been added. The migration of update rules, 3.x InfoObjects, and transfer rules is supported. Near-line storage has been added to information lifecycle management. A where-used list for requests makes it possible to display dependent target requests for a source request. The Administration functional area of the Data Warehousing Workbench has been enhanced. The documentation for TLOGO objects has been updated. On the Metadata Indexing tab page for the BI metadata search in the Administration functional area of the Data Warehousing Workbench, you can use Metadata Search/ Documents to check the settings required for the BI metadata search and to index the metadata. The user interface has been redesigned. The entry section for technical content has been updated. Certification of partner content allows you to officially document the technical quality of your content for your customers. Processing of subqueries can now be performed independently of the type of InfoProvider. Using the new BIA index maintenance wizard, you can create and activate a BI accelerator index, each in one step, and then fill or delete it as necessary. The relevant parts of the BI accelerator documentation have been modified accordingly. Functions have been added to the BI accelerator monitor (Goto menu, BI Accelerator menu). Numerous new tests for the BI accelerator are now available in the analysis and repair environment. The area of BI query runtime statistics has been documented in detail. The documentation for BI Integrated Planning has been extended. The documentation of the BW-BPS Web Interface Builder has been revised and enhanced with respect to the design templates and the new BW-BPS design. Query Design: BEx Query Designer - Changes have been made to the definition of noncontextual variables in the variable editor. Only exit variables can be marked as noncontextual. Enterprise Reporting - Reports from the Report Designer are displayed in the portal (Web) using the standard Web template for reports. Using conditional formatting, individual characteristic values can be highlighted in a report with a dynamic section. In the BEx Report Designer, you can create a balance sheet that contains assets and liabilities next to each other. General Services in BEx - The search functions in the BEx open dialog now include an advanced search in BI object attributes as an additional search method. You can now overwrite existing BI objects when you save new BI objects. There are some restrictions you need to note when using the various BEx tools and runtimes from SAP BW 3.x and SAP NetWeaver 7.0. · The documentation on MultiProviders now includes background information about consistency checks for compounding. · The documentation on BAdIs in the formula builder in transformation now includes a description of how to implement a category. · The documentation on real-time data acquisition now includes detailed procedures for real-time data acquisition using the service API and the Web service. It also includes detailed information about the request concept and a description of monitoring. · Small additions have been made to the documentation on aggregates and the BI accelerator. · The documentation on BI integrated planning now includes detailed information about lock management. · In the BI integrated planning documentation, the documentation on standard planning function types has been restructured. · The documentation on BI integrated planning now includes information about form-based planning. · Query Design: BEx Query Designer - Characteristic properties: Information about new access types for result values and filter selection options for query execution is provided. Access types are now set in the Characteristic Properties dialog box and no longer in the Web items for filtering (Dropdown Box, Radio Button Group, Checkbox Group, List Box). Gantt chart: Data column concept has been enhanced. Start and end times can be defined using both date and time. · BEx Web The Web Application Designer documentation now includes information about formatting Web applications and storing and including graphics in Web applications. It also includes information about how to create language-dependent texts using the text input dialog and how to transport them. · Information Broadcasting - You can encrypt and sign e-mails sent using an SMTP server. XML (MS Excel) can be used as the output format for precalculating and distributing BI objects. · The documentation on the administration and use of Crystal Reports has been removed as the OEM partnership has ended. · The documentation on transporting source-system dependent objects has been revised and extended. · A section about the characteristic relationships for time characteristics has been added to the documentation on modeling planning scenarios. · BEx Web - Using the pattern wizard, you configure BI patterns such as the Information Consumer Pattern.The examples for Web applications now includes a description of how you can use path replacement in commands. · General Services in BEx - The documentation on creating print versions of BI applications now contains a list of Web items that can be exported as PDFs and printed. Examples have been added to the documentation on modeling scenarios with BI Integrated Planning. An example of a MultiProvider query has been added to the documentation for BI query runtime statistics. A section on optimizing performance of data loading and on parallel execution of processes for multiple aggregates has been added to the documentation for performance optimization with aggregates. An example of a Web application has been added to the documentation on the BEx Web Application Designer. It shows how a selection made in a dropdown box can restrict the values for a dependent dropdown box. · The documentation for the Web items Chart and Analysis were updated and enhanced. In the documentation on data warehousing, a comparative description of the data flow in BI (SAP NetWeaver 7.0 compared to earlier releases) has been extended. A new description of a data flow migration to the new data flow with a transformation and DataSource (RSDS) has also been added. In the documentation on transformations, procedures for assigning InfoObjects in the rule details have been added. In the documentation on routines in transformations, an example of an inversion routine and an example of how you can migrate an existing inversion routine in the transfer rules have been added. In the documentation on the report-report interface, a description of how you can use a BAdI to create your own report type as a receiver has been added. In the documentation on general services in BEx, an overview of and procedures about how to work with the BEx objects queries, filters, and query views are now available. The BEx Query Designer documentation has been extended to include information about how to define queries in such a way that allows users to override default values for variables at runtime. In the documentation for the Web Interface Builder for BW-BPS, the documentation on the Integration of BEx Web Applications has been deleted. The documentation on selecting filter values in Web applications has been updated and enhanced. The documentation on creating planning applications in the BEx Web Application Designer has been enhanced to include three example procedures. The documentation on commands for planning applications in the BEx Web Application Designer has been extended to include a figure to illustrate the parameterization of the Execute a Planning Function (Simple) function. The documentation on local calculations has been updated. The documentation on information broadcasting has been extended to include a description of how administrators can set up broadcasting of content from BI to the portal and in federated portal networks. In the documentation on the Business Planning portal role, the note for the BEx Web Analyzer iView has been updated. The documentation on InfoSets now contains information about and examples of processing conditions for time dependencies. Information has been added to the documentation on data transfer processes. The documentation on analysis authorizations has been modified to include details about and examples of generating authorizations. Details about defining value authorizations have also been added. The documentation on the report-report interface (RRI) now contains detailed information about the process when calling the RRI. The documentation on constant selection has been modified to include a new example scenario. The documentation on using variables in Web applications was updated. The documentation on personalization in the Business Explorer was updated. The documentation on the BEx Web Analyzer was updated. The documentation on using parameters to call Web applications was extended. In the Information Field Web item, you can now specify whether only variables with values are to be displayed in the Web application. The documentation on exporting data to a CSV or MS Excel file was updated. You can now use the data provider command Export Data Provider As XML. The documentation on dynamic parameterization of commands and Web items was extended and updated. The documentation on inserting images and icons into Web applications and reports was updated. Information has been added to the documentation on transformations. Examples were added to the documentation on processing charts. These examples show how you can easily and quickly improve the layout of charts. A section about displaying NULL values was added to the background information about the formula operators for defining formulas in the BEx Query Designer. A section about a new cache mode was added to the documentation for query properties in the query monitor. 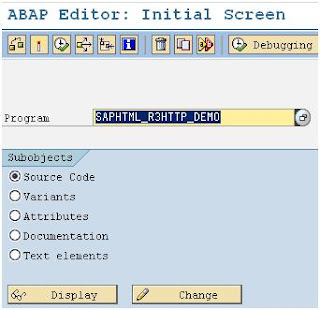 Web Application Design - Detailed information about formatting tables, trees, labels and fields was added to the documentation about using portal motives in SAP NetWeaver BI. Web Design API The documentation on the Web Items Button Group and List Box was updated. The documentation on the Web template parameter STATELESS was updated. The documentation on bookmarks in Web applications was enhanced. Bookmarks are used or created when the commands SAVE_AS, SAVE_BOOKARK and SAVE_PERSONALIZATION are executed. Analysis and Reporting: BEx Web Applications - The documentation on the properties of the characteristic was enhanced. BEx Query Designer - The documentation for the properties of query components now contains a new section. This deals with how the standard values are derived for properties. The documentation for the selection/formula properties in the Aggregation, Planning and Calculations sections has been expanded. The documentation for functions in the Query menu has been expanded. BEx Web - The Web Design API now contains the Set Status of Module command. Integrating Content from BI into the Portal - The documentation for the sender-receiver assignment in BEx Web Application iViews has been restructured and expanded. See official help.sap.com page and release notes by NW.